World Architecture Festival 2015: the 2002 science-fiction movie Minority Report "influenced the future" and helped make dozens of contemporary technologies a reality, according to the film's production designer. Gestural interfaces, flexible displays and voice activation are among the predictions in the film that exist today thanks to the movie, Alex McDowell said. "I think it certainly influenced the future," the British designer told Dezeen. "I think we absolutely have the ability to have influence the way things develop." In his keynote speech at World Architecture Festival in Singapore, McDowell said that over 100 patents have been issued for ideas first floated in the movie, which is set in Washington DC in the year 2054. Other technologies predicted by the film include driverless cars, wearable technology, 3D video and digital advertisements that recognise who is looking at them and adjust their content accordingly. McDowell, 60, said he came up with the ideas for the film after an extensive period of research into cutting-edge technologies, which the design team then extrapolated into the future. One example is the electronic billboards that are ubiquitous in the movie and which deliver personalised images and spoken messages to inhabitants – an idea he got from online store Amazon. "The idea of consumer recognition, where Tom Cruise is walking through the mall, came directly from Amazon," McDowell said in an interview with Dezeen after the lecture. "To be told that if you like this book you'll like these other five, is a really good service. It seemed logical to think that would make its way pervasively into culture." Directed by Steven Spielberg and starring Tom Cruise, much of the movie takes place in an futuristic high-rise city built across the Potomac River from Washington DC. McDowell designed the entire city in great detail at the start of the movie-making process – a then revolutionary step, since production designers traditionally only come on board once the script has been finalised, and designers usually only generate locations that will feature in the film. Instead, McDowell envisioned the whole city, its transport infrastructure and its social, political and cultural systems, as well as the gadgets used by inhabitants. This approach enabled the writers to use the city and its technologies as narrative devices, meaning the city itself influenced the plot of the film. The driverless cars that can travel both horizontally and vertically, for example, led to the creation of the movie's chase scene. McDowell, who runs 5D Global Studio in Los Angeles, calls his holistic, design-led approach "world building" and he has since used the technique for other movies, including 2004's The Terminal, which involved the construction of a life-sized fictional airport terminal; and 2013's Man of Steel, which saw McDowell invent a language, culture and architectural vernacular for the planet Krypton. One of the most famous scenes in Minority Report comes early in the movie. It introduces the gestural interface that Cruise's character, crime investigator John Anderton, uses to call up and view video footage of crimes taking place in the city. By moving his hands and arms, Cruise can switch between clips, fast forward, zoom and freeze the action, which is projected in front of him. "The gesture system in Minority Report is the best example I've come across yet [of how the movie has influenced contemporary technology]," McDowell said. "I think gesture recognition would not have evolved the way that it has without Minority Report," he added, referencing G-speak, Leap Motion and the new Lenovo Vibe smartphone as contemporary iterations of the technology that have been influenced by the film. 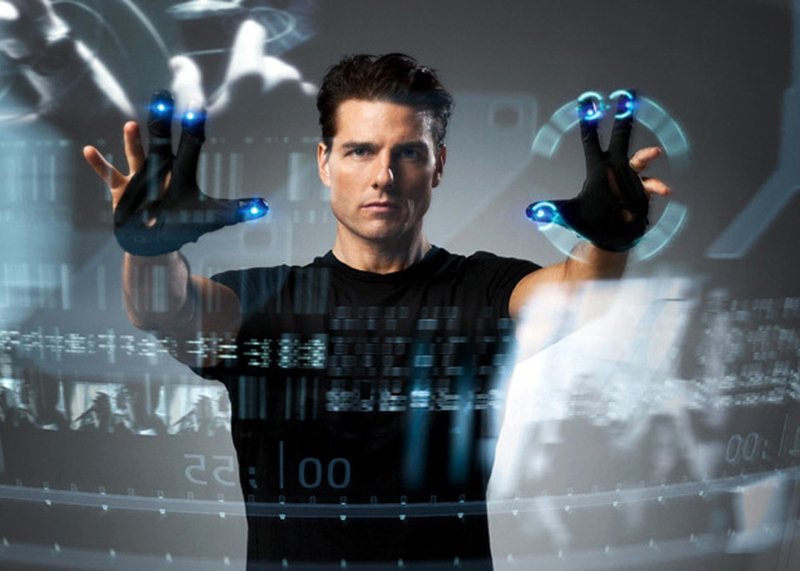 Minority Report is not the only film that has had an influence on real-world technologies. Last month, designers told Dezeen that 1980s sci-fi classic Back to the Future created a "self-fulfilling prophecy" for hoverboards, drones and augmented reality devices.